People who know only about cleansing and body oil might be unfamiliar. This will be really helpful to people who have dry skin in wintertime. This protects the appearance of fine wrinkles showing because of the dryness. 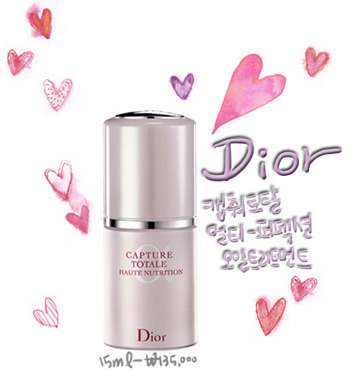 It has high moisturizer so even for dry and middle skin type provides with high moisture and calms down the keratins. This is different from other oil products. Cleansing oil is to melt the waste from the makeup and form body oil as well which is heavy. This oil helps the skin to recover. It is different from providing the nutrient right on the spot but having persistency and helps the skin to build protection itself. 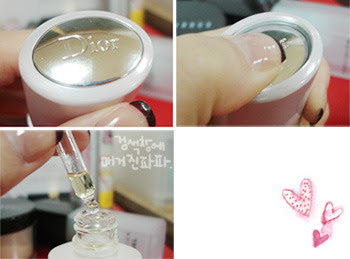 The most important feature of Dior oil treatment is the use feeling. I have tried and I felt that it was too rich and heavy. I thought my skin would turn really oil so I stopped to use it. From than on I didn’t use facial oil. It is oil but it is very watery like an essence. When you put one drop on your hand, it easily slides down. It is watery so one drop could cover the whole area in the cheek. Two drops will be fine for covering the whole face. When you pat on it will easily absorb. It is oil but still give the light feeling. When you want to feel it use little amount. You can use 1 to 2 drops to take care of the dryness. It is a eye dropper shape so when you press it the oil falls down from the dropper. First make your hands hit up by rubbing it than drop 1 to 2 drops to apply all over your face. When you apply with perfect amount and in a way that absorbs will make your makeup to settle. When you are middle skin type use it only on the place where it’s dry. If the skin type is dry or very dry use a toner and oil after finish it with a cream. If you really need to use essence use it after the oil. When you use this you can last the winter with only 2- 3 basic skin care cosmetics. If the oil is too rich you would think how can I apply oil before than essence. However the texture is really light. When you see keratins on different spots you could place it some on tips of the cotton buds. There is anti aging formula so you can neglect to use anti aging product. If you have severe dryness than you will be concern with the fine wrinkles but it is better to focus more with the moisturizing. First of all the price is too high. When I use this I don't have to wear cream because it was enough for me. So think as taking out the cream and anti aging products, the price isn’t too high. ooohh.. that product looks great! this product seams very valuable! thanks for sharing! Great seeing your honest opinion in this review! Especially important for high-end products.